Dino D-Day is an exciting new First Person Shooter from 800 North (AKA Digital Ranch Interactive). This is an HL2:OB mod that has served as a prototype for a commercial release we are currently in the final stages of preparing. It is playable though we have not been supporting it for several months as we've focused all of our efforts on the commercial product. The commercial release is slated for March 1, 2011 only on Steam. It is a fast-paced multiplayer game with 12 playable classes including 3 dinosaurs. 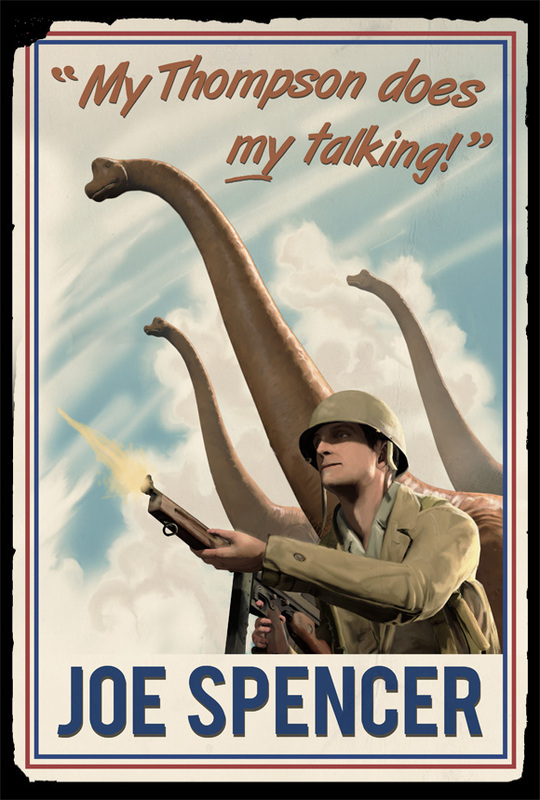 You've played World War II games...but have you played a World War II game with dinosaurs? Is it just me or does his face and posture seem pretty much like those of the dinos? I'd rather not get my Thompson out thanks.. Posters for all or our playable characters in Dino D-Day.